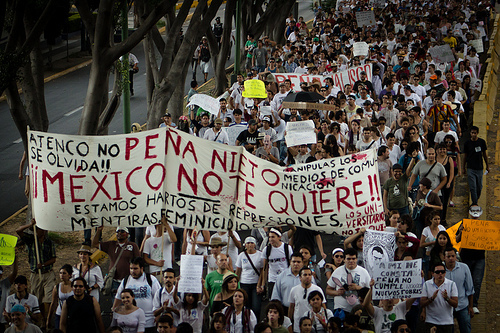 During the past presidential campaign in Mexico, sitting president Felipe Calderón of the National Action Party (PAN) quipped that it was “paradoxical that while in many other countries, protests take place against the government in power, in Mexico they are aimed at other actors.” He was referring to the “#YoSoy132” student movement and its targeting of Enrique Peña Nieto of the Institutional Revolutionary Party (PRI) — then a candidate, and as of December 1st the country’s new president. Calderón had a point. But he was gravely missing the picture. In a country where well over 40% of the population is poor, and over 10% live in extreme poverty, young mostly middle-class sectors do not appear to be the most vulnerable group. So why is it that students — initially from a private university — are spearheading protests? Perhaps because they still have something to lose. Arguably the most exciting development during the presidential campaign was the eruption of an anti-Peña Nieto movement that managed to shutter his image of utter invincibility based on a double-digit lead in the polls. At the immediate level, the movement aimed to stop the PRI’s return to the presidency, a post the party held for seven uninterrupted decades prior to a twelve-year hiatus that has now ended. What started with booing and heckling during a campaign visit to a private university grew to a national movement in a matter of weeks. The “democratization of media” became a central demand of the movement, as Televisa, the country’s monopolistic television network, was seen as having a preference for Peña Nieto. But the movement always felt broader than its immediate aims; it tapped into a generation’s more profound feelings of discontent. Many started dreaming of a “Mexican Spring.” The label proved premature: YoSoy132 has now mostly deflated, unable to find a role for itself in a post-electoral scenario. And yet, the movement points to a deeper fissure — one which is unlikely to be resolved in the immediate years to come and will hence prove a critical political challenge to Peña Nieto’s presidency. The past years have witnessed significant downward pressure for the middle class, along with the closing of traditional venues of upward mobility for lower middle classes. According to the National Institute of Statistics (INEGI), Mexico has a relatively low unemployment rate that hovers between 5% and 6%. This rate is misleading for at least two reasons: it used to be half of that a decade ago, and, more importantly, a whopping 30% of those “employed,” work in the informal sector (this percentage has been steadily increasing since at least 2000). People in the informal sector do not necessarily qualify as low-income (60% of them don’t), but they do have to cope with severe insecurity: income is not stable, no quality health insurance, no retirement pension, no “career” to be made. More to the point, unemployment hits those under twenty-nine at almost double the national rate. And educated people bear a big part of the brunt: close to 40% of the unemployed have at least a high-school degree (while those with only elementary school education account for barely 8% of the unemployed). The largest increment in underemployment (where one job is not enough to make ends meet) since 2010 has been within the lower middle class. Unsurprisingly, surveys by the polling agency Mitofsky found in September 2011 that 80% of respondents thought their economic situation had worsened when compared to the previous year, and 70% expected their situation to grow worse in the year to come. At the same time, traditional venues of upward mobility for lower middle classes have been gradually closing. Public universities deny admission to tens of thousands of students each year; aspiring students in the past years have undertaken marches, sit-ins, and other desperate measures to secure a spot, even as the certainty of a relatively good job after graduation declines. The past decades of neoliberal re-structuring have meant that low-ranking government jobs (a source of stable employment), have cut down on benefits that used to make up for low wages. Migration to the US – a key safety valve – has hit net zero as the economic slump continues in the hitherto receiving country. A labor reform currently being debated in Congress and that will likely be passed, adds fuel to the fire by allowing employers to hire people under more precarious bargaining conditions, probably increasing the number of jobs in the short term, but undercutting the incentive for the creation of better quality long-term jobs to which young people can aspire to. Even if reality continues to erode young people’s life-path expectations, a full-blown “Mexican Spring” is, of course, unlikely. Middle-Eastern youth were fighting against regimes often lacking the slightest semblance of democratic governance. That is not the case in Mexico, where fractions of the left and the right have a vested interest in sustaining the current electoral system. Even a wide scale movement with a reformist agenda will have to overcome key organizational obstacles: the consensus decision-making structure of Yosoy132 has so far blocked efforts to yield a concrete program of action; the electoral left is sufficiently divided and discredited so as to offer only minimal support to a future movement (even if the movement was willing to accept it, which is doubtful); sectors theoretically amicable to antagonistic mobilization such as unions and grass-roots organizations in low-income neighborhoods, are often caught in a clientelistic web connected to the PRI itself. A future movement will also have to articulate clearly the economic subtext of their political demands. If Calderón took the student protests during the past campaign to be narrowly concerned about the return of the PRI and media access, he was mistaken. For one, his party ended in a distant third place in the race. Also telling is the fact that, according to exit polls by Grupo Reforma, the left leaning runner-up candidate Lopez Obrador garnered most of the support of the college-educated youth. If a movement was able to crystalize, however fleetingly, against the return of the PRI and not against Calderón’s National Action Party, this is because the symbolism of having been the long-standing opposition party that finally dethroned the PRI in 2000 still carries enough clout to make it difficult to rally cross-sectional opposition against it. The protests during the electoral campaign emerged out of economic conditions that intensified during Calderón’s tenure. Downward mobility for the middle classes and increasingly limited upward mobility for lower classes were a feature of his presidency, and they are likely to continue and increase in the years to come. The questions that remain then are: what political form will this underlying tension take, and how, to use Calderón’s words, will these “other actors” — who are now “the government in power” — react?